Infection may also be triggered if you handle the tick incorrectly during removal! The UK Government fact sheet, “Tick bite risks and prevention of Lyme disease”, and other experts agree that it is extremely important to remove ticks safely, correctly and without delay due to the the risk of dangerous infection. Basically, to keep the blood flowing, the tick will regurgitate into the host (you) after a few hours (expert opinions vary from 8 to 24hours ) but may occur sooner if you handle the tick incorrectly during removal. 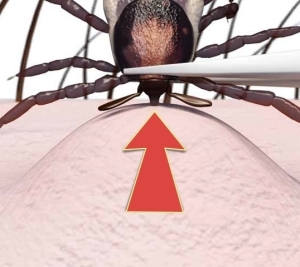 1) You need to grip the head of the tick close to the skin without squeezing it’s body. If the tick’s body is compressed it is likely the tick will regurgitate into the host (you), therefore transmitting any dangerous disease it carries. DO NOT SQUEEZE ITS BODY ! 2) You need to try to remove the tick in a stressfree, ‘clean’ swoop AS SOON AS POSSIBLE. Injury, stress and irritation causes the tick to regurgitate into the host (you) – so does delay. Do not try to suffocate, twist, poison or burn the tick while attached. And you should remove the tick as soon as possible without irritating or stressing it. The longer it stays attached the higher the chances of it regurgitating and transmitting dangerous infection into the host (you). 2. Gently push the card forward and upward with steady, even pressure. Remove small, not yet engorged ticks with the smaller notch. NOTE: Normal tweezers do NOT work for tick removal! They squeeze the body, causing regurgitation. If you want to use tweezers you need special pointy tweezers. Conventional methods of removing ticks can be dangerous. Ticks can carry dangerous microbes in their saliva and body fluids. Do not squeeze, stress or burn a tick – it may regurgitate or put more saliva into you. Do not use regular tweezers as they squash the body! Do not use petroleum jelly, oil or any chemical products before removing it. Never pull or twist a tick as its mouthparts may break off and remain in the skin. Avoid touching removed ticks. Dispose of ticks safely. Do not squash them between your finger nails. If possible disinfect the bite area after removal and wash your hands and the TickCard or any other removal tool with hot soapy water or some other disinfectant. 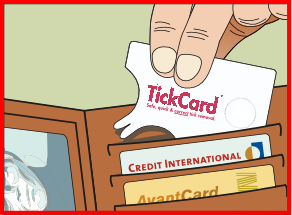 The TickCard™ can help you avoid potentially serious disease – keep it with you and don’t delay proper removal! Credit-card size: Fits neatly between your other cards so you have it when you need it. With a TickCard in your wallet you are always prepared. Serious tick-borne diseases include Lyme borreliosis which is increasingly common throughout Europe (including the UK) and America. Symptom patterns vary from person to person. Early indications in the days after the bite can include flu-like symptoms, feeling unwell, a rash, headache, muscle pain, tender glands and sensitivity to temperature, sound and light. We also offer holistic and alternative self-help suggestions.